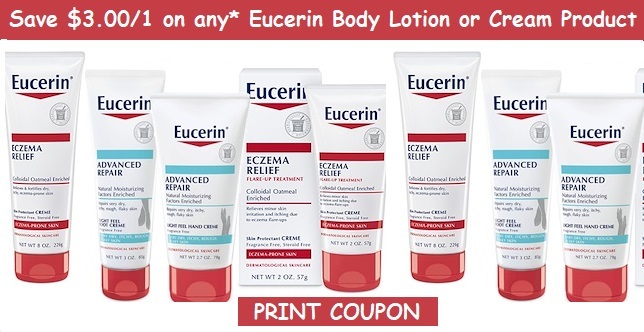 Eucerin Coupons | Save $3.00/1 Eucerin Body Lotion - PRINT NOW! New Eucerin Printable Coupons. Save $3.00 on any ONE (1) Eucerin Body Lotion or Cream Product (8 oz. or larger) Or Eucerin Baby Product. Get your printers Ready CVS Couponers! Get your High Value $3.00 off one Eucerin Body Lotion - PRINT NOW! Save $3.00 on any* ONE (1) Eucerin Body Lotion or Cream Product (8 oz. or larger) Or Eucerin Baby Product.